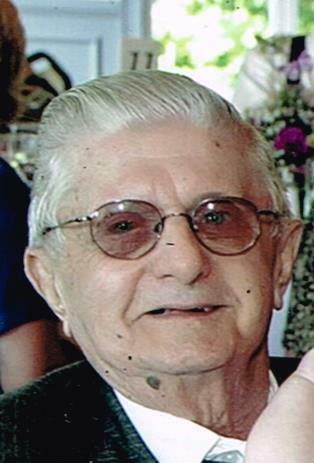 Obituary for George E. St. Laurent | Brown Funeral Homes, Inc.
George E. St. Laurent, 90, resident of Burrillville for 54 years passed away on November 23, 2018, at Ashton Court in Harrisville. He was married to the love of his life for 49 years to the late Barbara (Griffin) St. Laurent. He was born in Central Falls, son of the late Alphonse & Stacia (Pearson) St. Laurent. George owned & operated St. Laurent Landscaping for 68 years serving areas in MA & RI. He served in the Army as a private Army Air Force Base Unit as a chef and air plane handler during WWII. He loved his wife with all his heart, enjoyed spending time with his family at cookouts and birthdays. He made great memories at Hampton Beach, loved cooking for his family, fishing and his passion for sports, especially the Boston Red Sox. We know you were smiling as you reunited with mom and all your loved ones, Rest in Peace Dad. He is survived by his 5 children Patricia Ducharme of No. Providence, Paul St. Laurent of Westwood, Peter St. Laurent of Foxboro, Jackie Farley of Cumberland and Mary Belisle of Burrillville, 11 grandchildren Neil, Missy, Kristen, Michael, Matthew, Pamela, Ryan, Roslyn, Jonathan, Amanda and Patrick, 6 great grandchildren Juliet, Evan, Hannah, Halley, Ronald and Andrew. Besides his wife he was preceded in death by his granddaughter Emma Rose Hanrahan. His funeral will be held Wednesday at 9am from the Brown Funeral Home, 1496 Victory Hwy., Oakland with a Mass of Christian Burial at 10am in Our Lady of Good Help Church Victory Hwy., Mapleville. Burial will follow in St. Patrick's Cemetery in Pascoag. Calling hours will be held Tuesday from 4-7pm. In lieu of flowers donations in his memory may be made to the Hope Hospice & Palliative Care of RI, 1085 North Main St. Providence, RI.